02.28.2014, Uncategorized, by Jack W Perry. CREATIVITY, INC. — I finished reading this book last week. It will be a Classic. It is the story of Pixar. The subtitle is “Overcoming the unseen forces that stand in the way of true inspiration.” That is a mouthful. 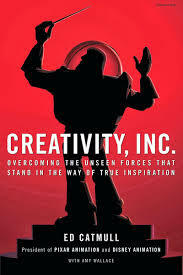 The book is Ed Catmull‘s story. Catmull co-founded Pixar with John Lasseter. Add in 26 years with Steve Jobs and how Pixar grew from a small money-losing segment of George Lucas’ empire to taking over Disney Animation is a true fairly tale. The writer is Amy Wallace. She did a great job. Wallace has written for over 20 major magazines. She recently did a piece in NY Times Magazine on Baz Luhrmann That was an insight into brilliance too. This is a business management book. It is about how to manage a successful company but still retain the creative spark. How do you become corporate and bottom-line driven. but also remain fresh, new and relevant? I have been tweeting as I have been reading. I probably sent 40 tweets over the past few weeks. I don’t have a lot of followers (<1,000), but I still like tweeting and feel it effective. What has been so cool is the co-author, @msamywallace has been kind enough to re-tweet me on numerous occasions. Thank you Amy. a Penguin Random House Company, New York.